In the pre-season period, they will renew the stadium pitch. They started working on June 1. The CEO of Shakhtar-Service Vadym Gunko gave us further details. - Vadym Ivanovych, is the decision to renew the turf a scheduled one? - Of course, this need has been brewing for a long time. We have obtained the appropriate approvals. We also informed all involved parties, including the management of the OSC Metalist, the Kharkiv Oblast State Administration, the club Metalist 1925. Unfortunately, we could not start the process earlier, because the last match at the stadium was held on May 31. On June 1, the restoration works started. - What’s the reason behind this need? - In the upper layer of the turf, a large amount of organic matter accumulates: some rotten grass, various dead remains. Over time, it actually turns into a kind of clay, a plastic mass, poorly air-permeable and having low drainage ability. That’s a rather slippery surface where various germs develop, which adversely affects the field properties. 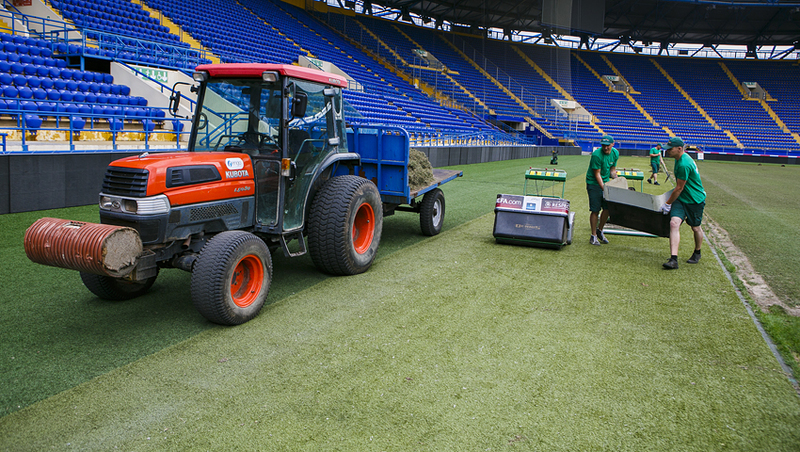 The OSC Metalist turf belongs to hybrid types: it was injected with special fibres using the Desso GrassMaster technology. To reveal its potential, renovation is necessary with the help of special equipment, which we managed to acquire in the UK in 2014. We already have a positive experience of doing it: in the spring 2014, at the Donbass Arena. This is a forced and absolutely normal measure. Earlier, the OSC Metalist turf was injected in the summer of 2011. Since then, six years have passed, and during this time they should have made two renewals. The issue got critical a long time ago, and there are no other options. Thanks to renovation, the quality of the field will improve and become optimal. - What are the main stages? - The essence of renovation is that we remove the top layer of the turf, do sanding and restore the Desso artificial fibres. Then follows the sowing of grass, appropriate fertilizers are added, aeration and other measures are carried out. Thus, the field is actually grown from scratch. The cutting of the upper layer began at noon on June 1. I want to note that the work was performed all day and night. The team of groundsmen worked until eight in the morning. That’s a very skilled, intensive and painstaking work, where you can’t miss a single minor thing. We expect to finish this stage on June 3, so that in the coming weeks the grass will be growing. - When will the first match take place on the renewed field? - Already in the second league round, Shakhtar can host a home game at the OSC Metalist. According to our estimates, on July 22-23 the pitch turf should be strong enough. I think that in the very first match the teams will appreciate the quality of the field, with its properties getting optimal by the Champions League group stage.